After cutting its forecast for Brazil’s 2018/19 soybean production by 4.5 million metric tons in early January, to 116.9 million metric tons, AgRural is likely to make further reductions in February, since hot, dry conditions have continued in several states throughout January. In addition to Paraná and Mato Grosso do Sul, the most affected states by the spell of dry weather seen in December, other states have seen their prospect yields shrink now in January, as warned by AgRural earlier this month (see below the revision released on Jan 9). AgRural will release a new production forecast on February 8. Stay tuned. 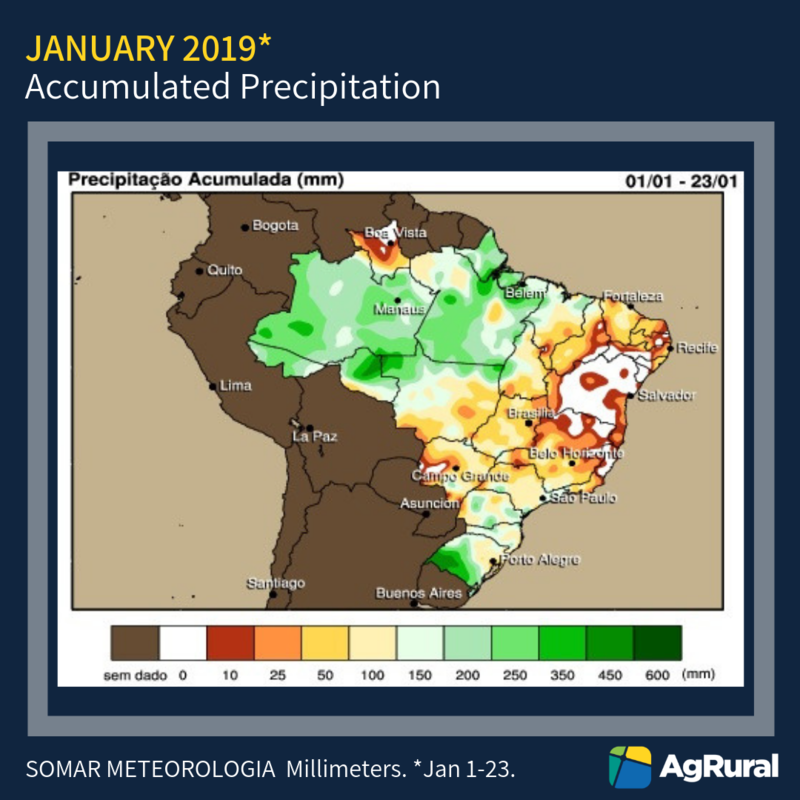 Irregular rains and above-than-normal temperatures in December, especially in Paraná and Mato Grosso do Sul – Brazil’s number 2 and number 5 producing states – got in the way of a new soybean production record for the country. 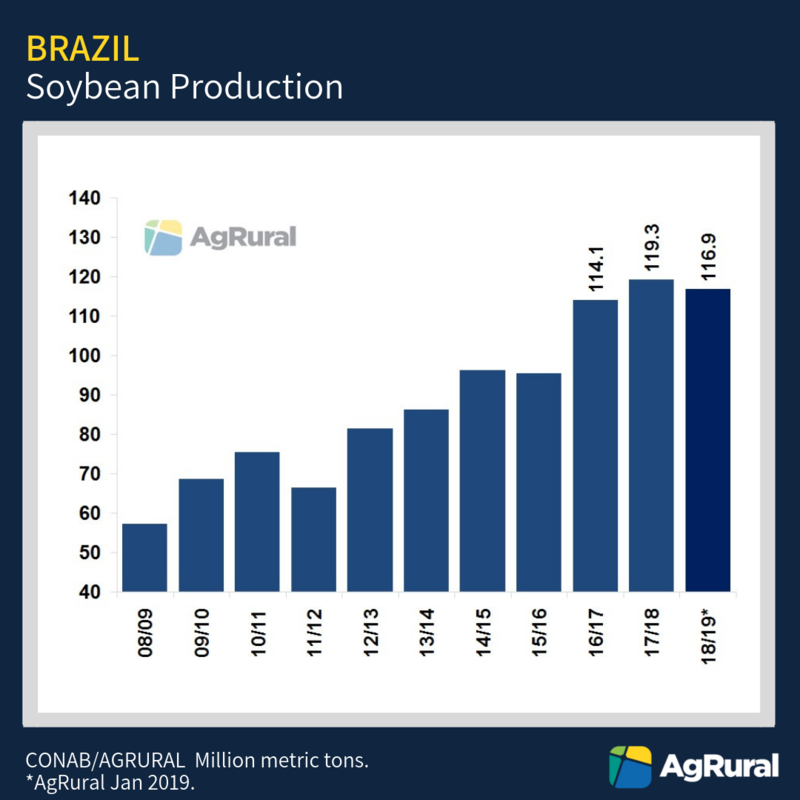 A new estimate finished today by AgRural puts the Brazilian 2018/19 soybean production at 116.9 million metric tons, 4.5 million metric tons down from 121.4 million metric tons estimated on Nov 30 and also below last year’s 119.3 million metric tons. The new production is based on an area of 35.9 million hectares (unchanged from Nov 30 and 720 thousand hectares above last year) and on an average yield of 3.258 metric tons per hectare, compared to 3.384 metric tons on Nov 30 and 3.394 metric tons per hectare in 2017/18. Yield and production numbers will be revised in early February and might have further reductions if unfavorable weather conditions prevail over the next three weeks. 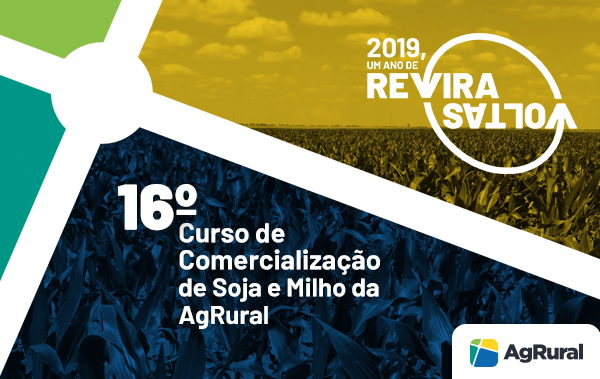 After the fastest planting pace in history and very good crop conditions during the initial development stages, the lack of rain and high temperatures started to concern farmers in Paraná and Mato Grosso do Sul, as warned by AgRural since early December. At that moment, however, it was really hard to translate the loss of yield potential into numbers, especially because there were decent rains forecasted for those two states in the last week of 2018. Those rains did come, but way too late for some areas and with irregular amounts and coverage. The result: significantly lower yields in areas planted in September with early maturity varieties, which were plenty of moisture during planting and emergence and were not able to develop deep roots. When the hot, dry weather came in December, those areas were already filling pods and there wasn’t much hope anymore for them. For Paraná, AgRural cut its average yield estimate to 3.150 metric tons per hectare, compared to 3.600 metric tons on Nov 30. It’s the lowest average yield for the state since 2015/16. All producing areas in Paraná were affected by unfavorable weather conditions in December, but the most damaged fields are located in the west, where farmers plant earlier. After a flawless soybean crop in 2017/18, Brazil’s number 5 producer Mato Grosso do Sul had high expectations for the 2018/19 season. But the hot, dry weather seen in December got in the way. All producing regions in the state have yield losses, but the most severe are concentrated in the south, in areas planted in the second half of September. Rains seen in late December and early January were better than those accumulated in neighboring Paraná and benefited areas planted later, giving farmers hopes of not so bad averages at the end of the season. But they still need good rains in January to avoid further losses. For now, AgRural puts Mato Grosso do Sul’s average yield at 3.162 metric tons per hectare, compared to 3.540 metric tons on Nov 30. Although Mato Grosso still is the positive highlight in the 2018/19 soybean season, Brazil’s number 1 producer also has some losses caused by the combination of irregular rains and high temperatures in December. In some areas, excessive rainfall also took a toll on yields. Losses are concentrated in areas planted in September, with early maturity varieties. That made AgRural cut its average yield estimate from 3.469 metric tons per hectare to 3.399 metric tons – still slightly above last year’s record, since farmers expect much higher yields in areas that will start to be harvest on Jan 15-20. Other states that had adjustments in their yields in comparison to numbers released on Nov 30 were Rio Grande do Sul, Minas Gerais, Goiás, and Rondônia. In Goiás, a dry spell started in late December has to be closely monitored, especially because forecast maps don’t show much rain for the state in the next two weeks. For the same reason, São Paulo and Minas Gerais are also worthy of attention. Yield estimates for the North/Northeast region known as “Matopiba” (Maranhão, Tocantins, Piauí and Bahia) were kept unchanged because those states plant later and it is still early to make any significant change in yield prospects, which were already a little conservative in the forecast released on Nov 30. But those states, and particularly Bahia, are likely to lose potential if rains remain irregular throughout January, as forecast maps suggest. The 2018/19 soybean harvest is already underway in Mato Grosso, Paraná, Mato Grosso do Sul, Goiás, Rondônia and in a few areas of Minas Gerais and São Paulo. AgRural will start releasing its weekly harvest progress updates this Friday, Jan 11. 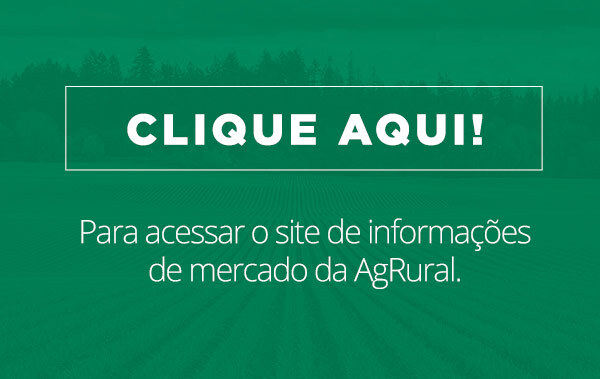 Would you like to know what is going on with Brazilian corn and soybean crops and markets every week? Click here to learn more about our services in English and request a free trial of our Brazilian Update!